Most people know what syndication means. We’ve all seen TV shows, listened to radio programs or read columns that are syndicated across several publishers. On the web, there are exponentially more media properties to distribute your content to, making the idea of syndication much more accessible, and much more of a possibility in spreading your message. Content syndication on the web is defined as the mass publication of a single article, podcast or video (content assets) across many outlets. In a nutshell: Write once, spread everywhere. Syndicating your content has obvious benefits—expose more people to your message—but it also plays a vital part in search engine optimization. As the search engines see more of your message online, pointing back to your website, they give more weight to your site. This is one of the most natural and powerful ways to build links to your website. But, the real bonus is that these articles, videos and podcasts are being found in places with far more traffic than your website, such as YouTube, iTunes and Squidoo, and some of those people are clicking through to your site. Content syndication is a key element to traffic building, and it helps with both article marketing and search engine optimization. I’m always a fan of leveraging a little bit of work into a whole lot of results, and that’s what good content asset and some content syndication can do for you! Icons used in the info graphic courtesy of Icon Drawer. 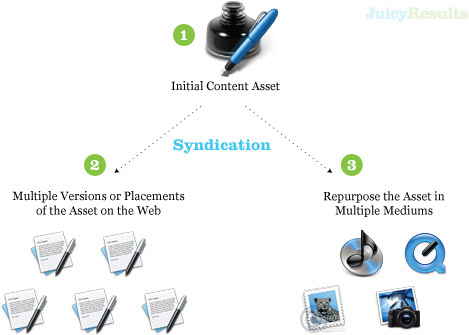 One Response to What is Content Syndication? I completely agree with you! But also, you have to keep in mind that before syndicating your content, it should be well-written and well thought of for in your content lies the success of you establishing your brand and creating web traffic.